Under the kitchen sink can be a messy place. It seems to be one of the hardest places to keep organized in the kitchen. 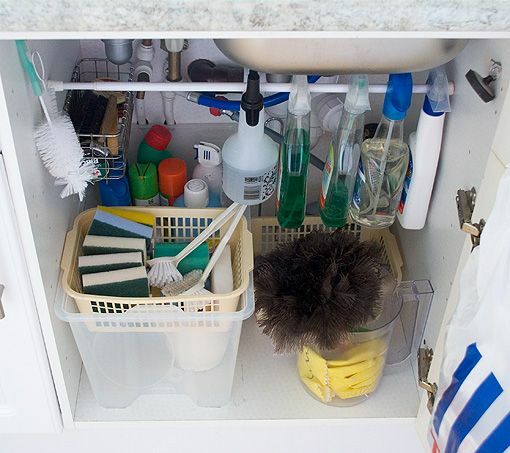 But Jen from A Thousand Words has conquered her clutter beneath her sink! Click HERE to view how she did it. What a surprise to see my project featured on your blog, which I’ve just discovered and am enjoying looking through. Thanks for the post! Thanks, Jen! I just started this blog in October, and I am enjoying featuring so many amazing bloggers! I have been so inspired to complete many of these organizing tips and tricks.